I stopped brewing beer some time ago. It was like baking bread while living in France. 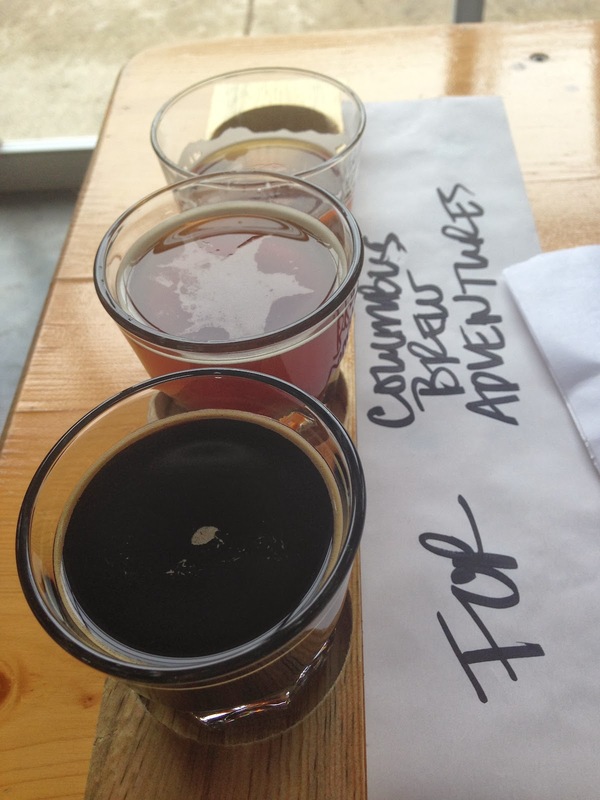 Columbus is home to many excellent breweries leaving the enthusiastic beer drinker with a desire to explore. Columbus Brew Adventures is in business to help. I decided to try their Downtown Tour to start my education. 1. 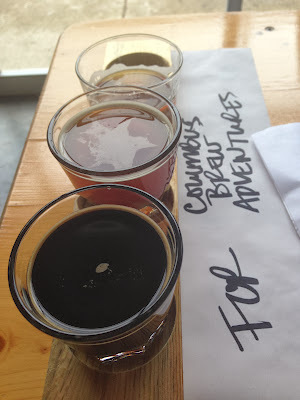 Columbus Brewing Co. We started with a tasty flight of their popular ales including Bodhi, which has been crazy popular since its debut. Bodhi is going to break some kind of record in Columbus for popularity, very hoppy with a not too bitter finish. That's all I'm saying, go try it. We also got to enjoy a liberal selection of tasty treats from the kitchen, it was a fantastic brewery to get started with. 2. Barley's Brewing Co. A personal favorite of mine for years. I was excited to learn a lot more during the tour than I had visiting and sampling beers on my own. We showed up and were shuttled to the basement (itself a rare destination) to see their shiny fermenters and receive our tasting from Angelo Signorino. Angelo is a dynamic guy who is passionate about his beer. His discussion of yeast and beer styles was worth the price of the tour. His combination of organoleptic and analytical evaluation of yeast over more than 20 years in the business is impressive. 3. Seventh Son Brewing Co. Next, our most capable tour guide gently herded his (more relaxed) flock to Seventh Son. I've sampled their American Strong Ale at Crest a couple times and couldn't wait for this stop. It is a raw facility with the fermenters and cooker shimmeringly clean and juxtaposed to a wide open space where happy people enjoyed their ale. Colin, their master brewer, walked us through the brewing process (including giving us a nibble of some malts) and providing a representative flight of their brews. 4. North High Brewing. They currently brew on a smaller scale than the other breweries we toured, but the equipment is located in the center of the bar! In my experience, that's unique. They also allow individuals to visit and brew their own under their tutelage and using their equipment. A few more samples and some history of the building in Short North made this stop quite special. I hope I haven't said too much; these tours are new. 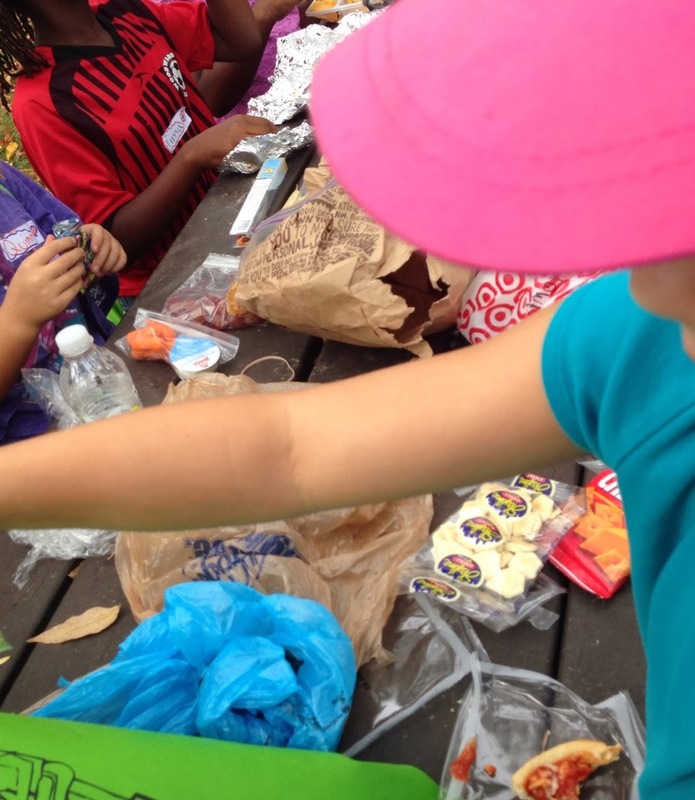 I had such a good time and wanted to share some of the experience. Our tour guide was informed, the duration of the tour very good and the pace was perfect, plenty of samples and snacks, I loved it all and look forward to learning about and sampling more of the brew scene in Columbus via the other available tours. Let's say one wanted to extract fermentable sugar from corn. Is it worth it to malt it first? 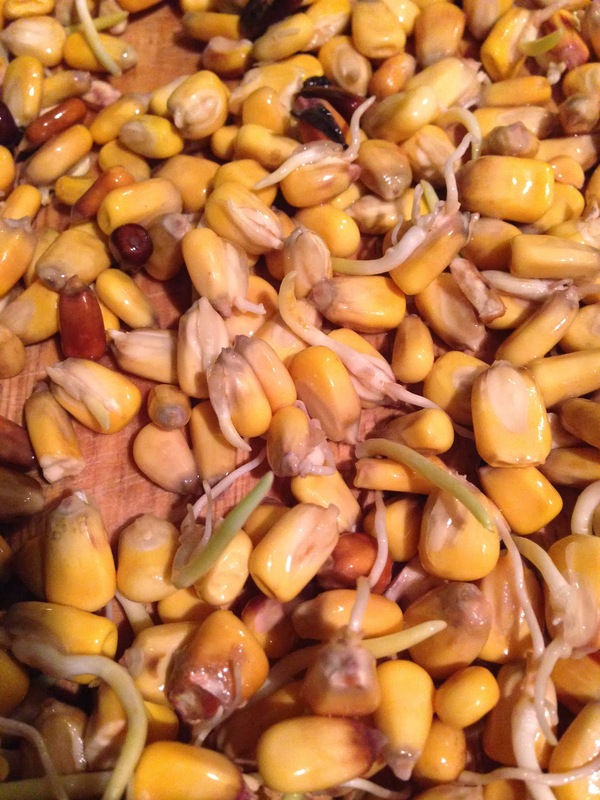 I took 300 g organic feed corn and covered it in water for two days, drained it, kept it moist by rinsing it a couple times a day and allowed it to sprout (see image below). Then, I spread the sprouted corn on the concrete floor of my basement for a couple days until the kernels lost most of their moisture and looked like they did when started (only with sprouts hanging out of them, I couldn't determine residual moisture). I did not pull off the rootlets and ground up each batch using a corona mill. I then ground up some unmalted feed corn from the same bag and infused each of them in 1000 g of 170F water. I stirred both suspensions several times during the hour and filtered off the solids via mesh paint strainer bag with no rinsing of the grain bed. Malted: obtained 806 g of solution with 7.5% w/w dissolved sugar, 60 g sugar. Unmalted: obtained 730 g of solution with 4.0% w/w dissolved sugar, 30 g sugar. For some reason the unmalted absorbed more water resulting in a smaller filtrate volume. Pretty big difference. The malting takes a lot of time, but almost no effort. If you need this kind of sugar for a project, I'd do the malting. With unmalted corn, it could be cooked for a long time to get more starch out, but then it gets gummy and difficult to filter. I simple infusion is operationally easier.